Child detention to end in May Jump to media player The government says it will stop detaining children of failed asylum seekers next May. 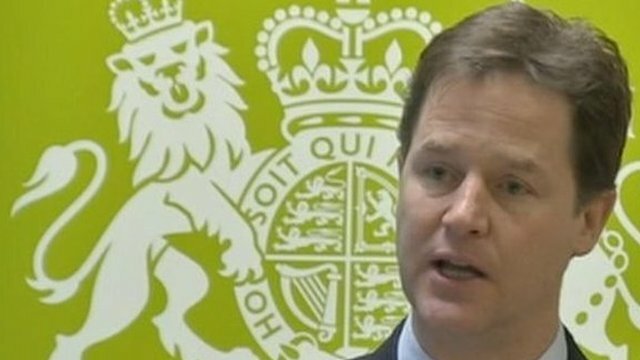 Immigrant children detention to end Jump to media player There will be no children in immigrant detention centres this Christmas, and the practice will be stopped by May, the Deputy Prime Minister Nick Clegg has said. The Government has promised to stop detaining the children of failed asylum seekers by next May. Families will stay in secure housing while they wait to be deported - but children will be allowed out with minders. The news was confirmed at a press conference held in London and attended by the deputy Prime Minister, Nick Clegg. It heard from Lorin Sulaiman who fled Syria with her mother and sister and sought asylum in the UK. She described how terrifying it had been for her, as a young teenager, to be held in a detention centre.